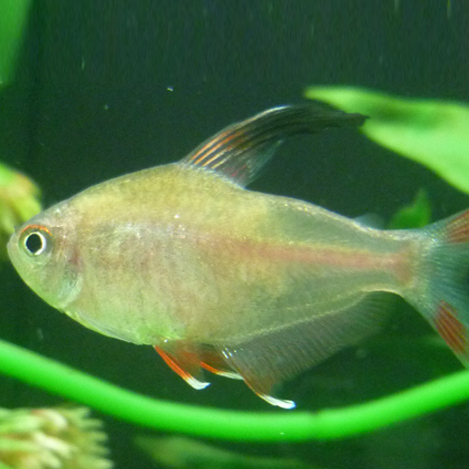 Hyphessobrycon Rosaceus common name rosy tetra. They grow up to 4 cm / 1.5 inches.They are best kept in water parameters of PH range 5.5-7.5, and temperature range 24-28 °C / 75-82 °F. 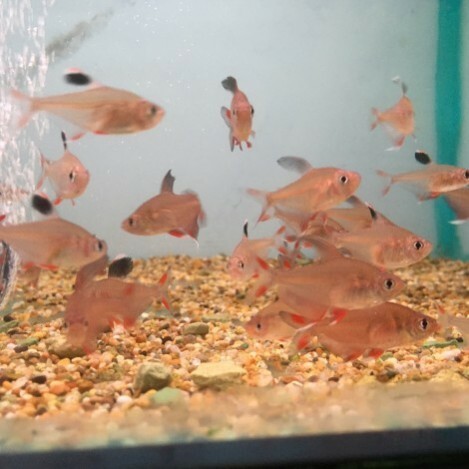 Rosy tetras are a very peaceful fish, they will not compete well with aggressive fish. But due to there shape they can go with bigger community fish. They are best in groups as they can be shy and timed on there own. They have a diet of flake, small pellets, and granular food. Also they enjoy treats like freeze dried, frozen or live foods.